I will use this thread to show the Works in Progress. Please critique this stuff! Last edited by mousekiller on Tue Apr 19, 2016 6:32 am, edited 9 times in total. I see magnler jumped inside the tree and roars from it I would probably add little bit more color to the model, perhaps some moss on the base. You certainly know how to paint white. I still struggle with it eventhough I watched tons of youtube videos. 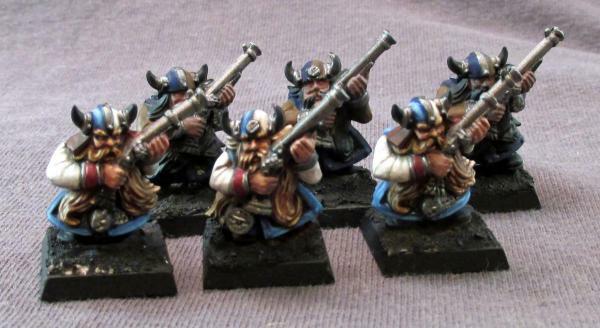 So, this past week (ok ok, TWO weeks), I have been working up Dwarfs again. The first that need to get done are the shooters, so the front three are pretty close (still need the leather bits, metal bits, and accessories done), and the back three are just base coated. 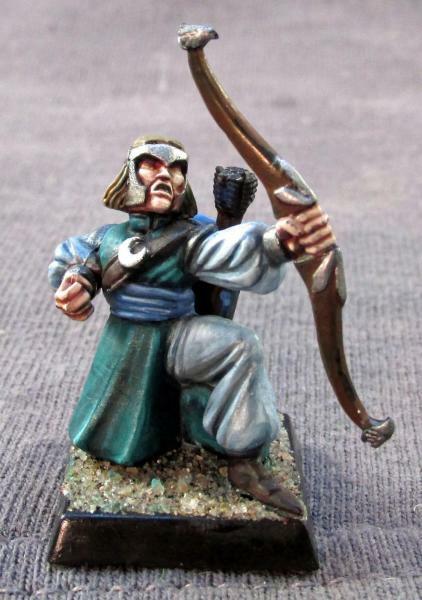 These 6 will round out the unit to 16, which is a pretty nice number to balance the 16 crossbows that I already have. Also, Kragg the Grimm got some love. I thought I was getting close with his beard, but from the picture it looks like it needs a lot more contrast. Other than that, the entire model still has a LONG way to go. 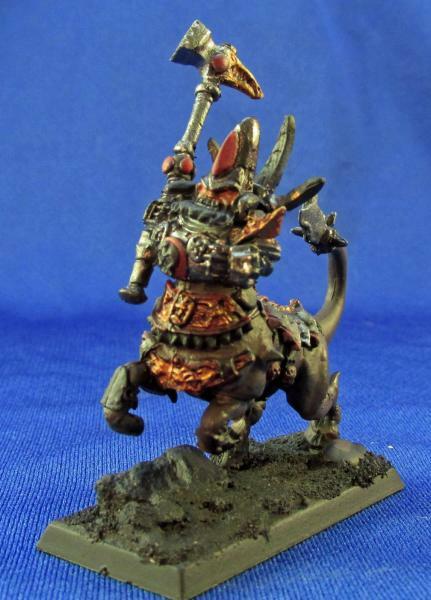 The stone thrower and crew got a base and a primer coat, as did the Chaos Dwarf Bull Centaur. Any thoughts or comments welcome! Loriel: It does appear to be a bit possessed . Thanks mate! So, I suppose that I can just pretend like I have not been gone for almost a year... Will anyone notice if I just pick up where I left off? Sorry guys! I have been busy this year though. I got married, am having my first baby, and switched to a new job. That is no excuse, I know! I have still painted a little... not nearly as much as I should have. Also, I am really upset with Games Workshop... I don't really care what they do with the game style but if you recall, I base all of my paintings on the story and world that they had created! Now they have completely destroyed that world. So, if it is perfectly fine with you all, I will stay in the world that was! I don't think that I forgot anyone, but if I did than I will add them into the appropriate category. So, to kick it off again, we will hit up a Neutral update. 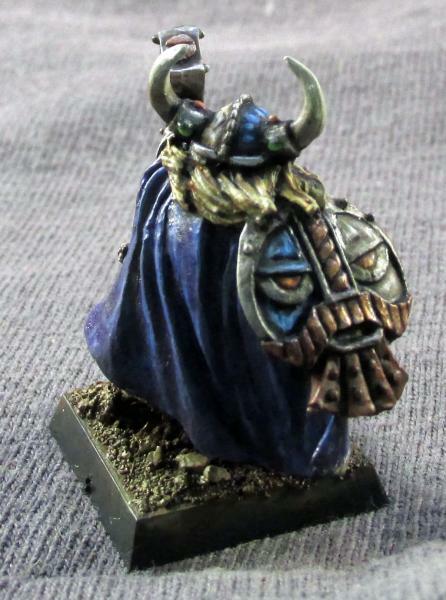 Mostly, I have been working on Dwarfs. Lots of Dwarfs. 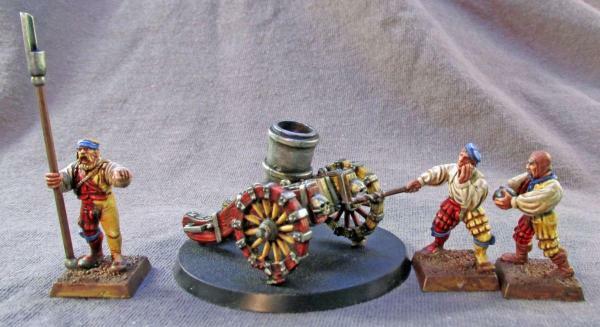 I finished a catapult and some reinforcements for the hand gunners, so I will post those updates against the Dwarf Army thread in the near future. 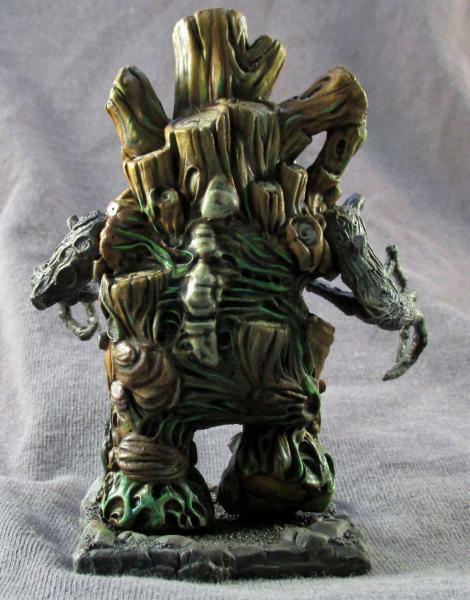 I also finished a little work on the treeman, who will be the initial center piece of the wood elf army and a good way to get them started. Other than the original skink, I haven't really dabbled with the Lizards, but I need to get something start that I am motivated to finish soon. 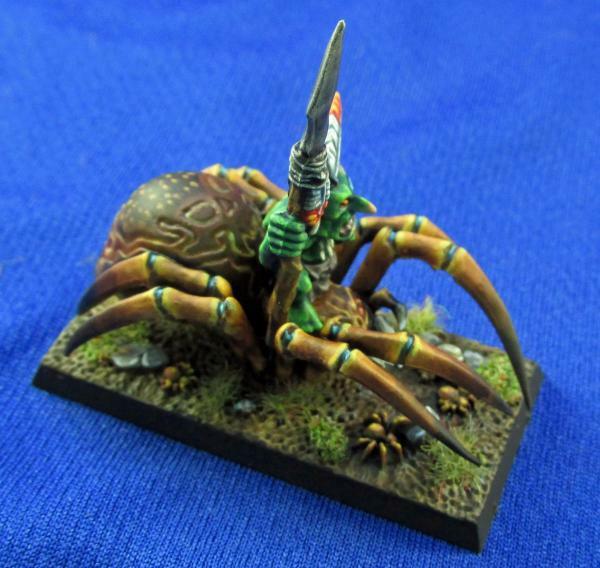 Started these old GW miniatures, originally dubbed as Bugmans Rangers. I have 17 of them total, so I will have to dig through my Reaper bits to find some appropriately sized companions to round us out to 20. The first is pretty much done, need to add snow and do another blue highlight. The second is close, have to finish his shield (not in the picture), the leather bits, and the metal parts. Of course the third only has a base of blue on it, and the fourth has a layer of primer that was applied almost 10 years ago. The next is the forge. This was a repaint, from long ago. I have worked up the wheels on one side, the warriors in the front. Lots more to do on this one. It is in a few pieces right now, which is why some of it may look tilted (the carriage, the anvil, the two warriors, and the hero on top. Also started this Hero. Have to work the metal, a bit more on the blue cape I think (it seems like it needs some sort of flair, suggestions?? ), and some pouches and other little things. 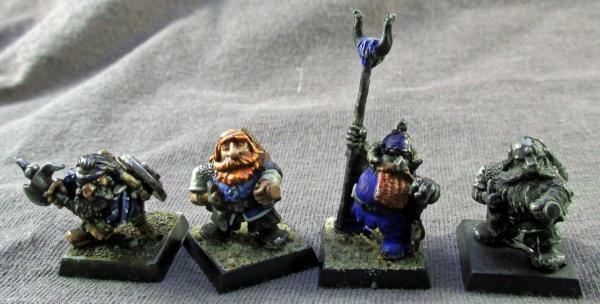 Then we have some Dwarfs from the Mantic range. I think they are going to fit in well. Side by side they are less robust and a little taller (especially against classic GW and some Reaper minis), but as a unit they will be fine. 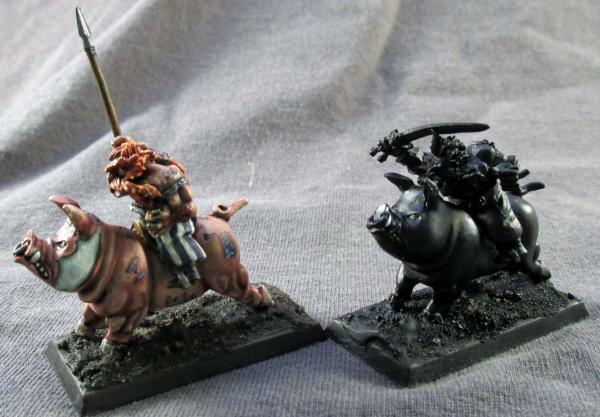 And I have a unit of 10 pig riders from the Dwarf Wars range by Westfall Miniatures. I have wanted to paint these for quite some time, but since there was no room for them in the armies of old Warhammer I waited. Thanks again GW for giving me complete artistic freedom to change the old world into whatever I want! The blue and white on the cheeks and the striped pants were afterthoughts, so I am still working them up. Need to finish the blue highlights on these, plus the metal bits, wood bits, and leather bits. I have done work on a bunch of other things, but I will update them in the perspective week. 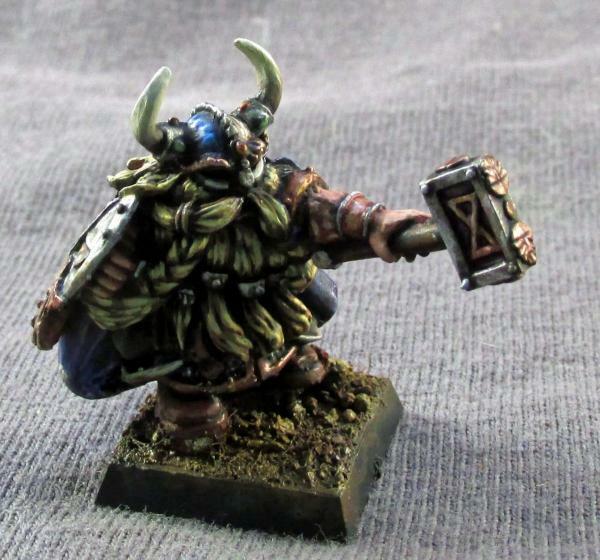 For me, the story is as important as the painting, it really gives life to my miniatures as I add color to them. If anyone is interested as to why these three races will be neutral: The Dwarfs will fight for gold, but for the most part prefer to stay within the mountain holds and not involve themselves in mankinds business. 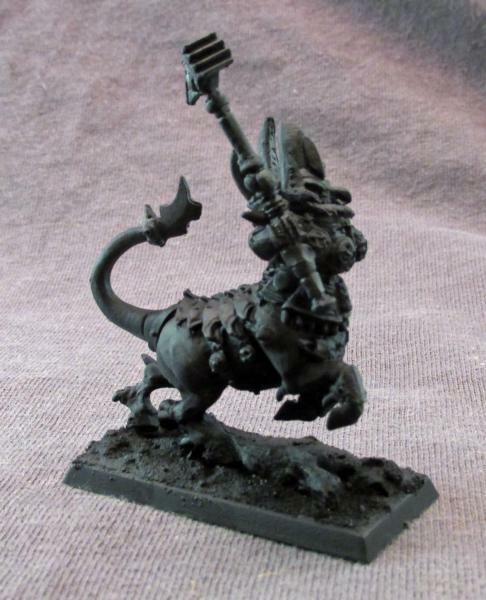 Lizards, although the Slann are majestic creatures, I feel govern much the same way - sticking to themselves. And Wood Elves, unlike the High Elves, retreated to the forests to get away from the world. So, to me, these three races represent the races who, if left to their own devices, would not bother the world one bit but if pulled into conflict will fight to the bitter end. Anyway, next week we will update the armies of Order! Until then my friends, and I am happy to be back! As far as excuses go, those are actually pretty good. Married perhaps not so much. But getting a baby... Those eat up time and energy What / when did you get (it)? So, if it is perfectly fine with you all, I will stay in the world that was! Hey, it's your party dude! 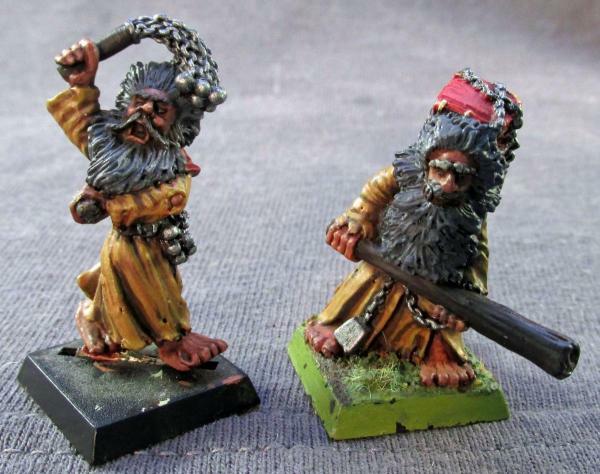 Nice to see the old Dwarfs, I like the way you've done the hero's beard too. Love the porkers! They look like the Naughty Pigs from Shaun the Sheep! So, this week I pulled out the old WIPs from the Order armies and started working. First up, we have Prince Imrik and his faithful dragon. This will be the first dragon I have ever painted. So far, he is pretty much covered in basecoat to define the color direction I want to go in, with the exception that I worked the red up just a little bit. 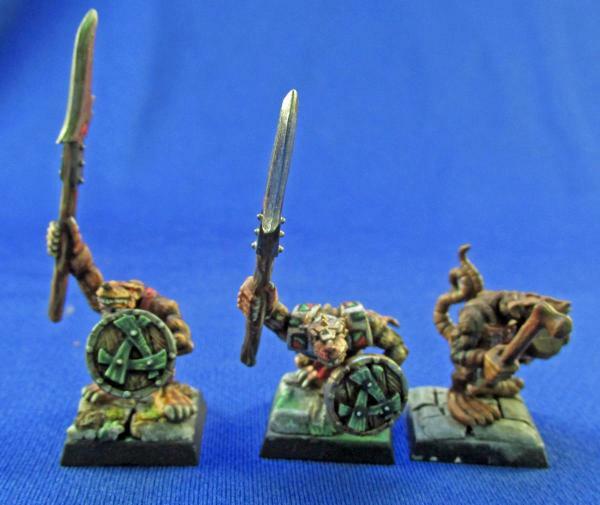 Does anyone know a company that still sells larger square bases? I would like to put him on a 60mm by 100mm. I will have to sink the base he is on now into the new base scenery somehow, because he is solidly connected! I tried prying him off and the feet broke in three places. Next up, I am still not quite happy with my High Elf test model. Would red be a better color than blue for the sash? Also, I changed the tint of the white from a gray to a more blue undertone. Need to bring the greens out some. Other thoughts? 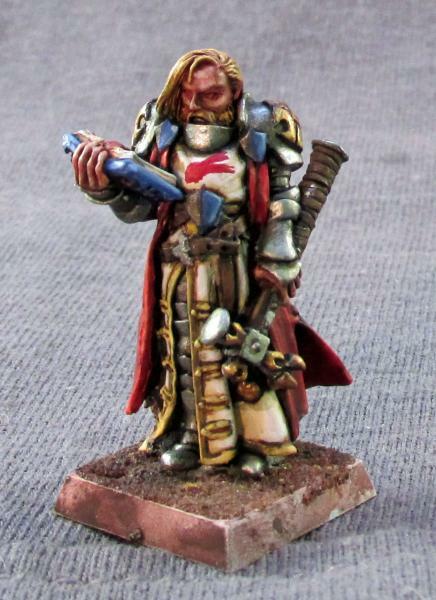 I want to have this test model done before the next order update. On to the Empire! The forces of Sigmar are getting lots of reinforcements. First, the Warrior Priest I have been working on for a while. I added a twin tailed comet to his shirt, need to work that up. Thinking of adding a black one to the underside of the cape as well. Have to add some script to the open pages of the book, then everything needs more highlights! 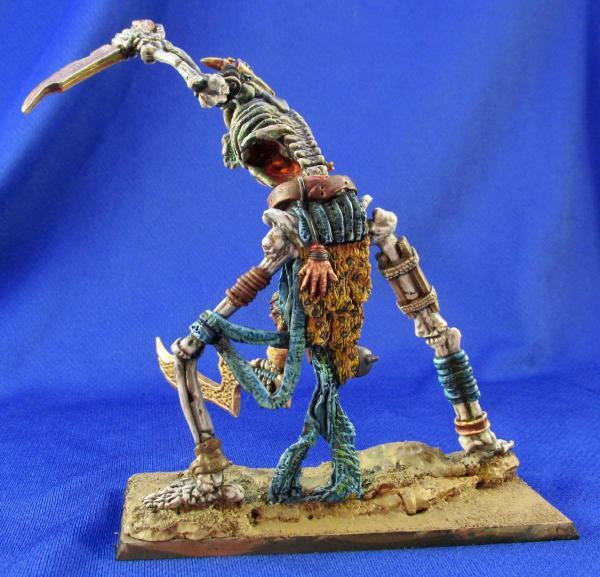 This is a Reaper Warlord model, anyone remember the name of it? Wizards! I have two from about two years ago that never got finished. They are not far off, except a few things I want to change now. 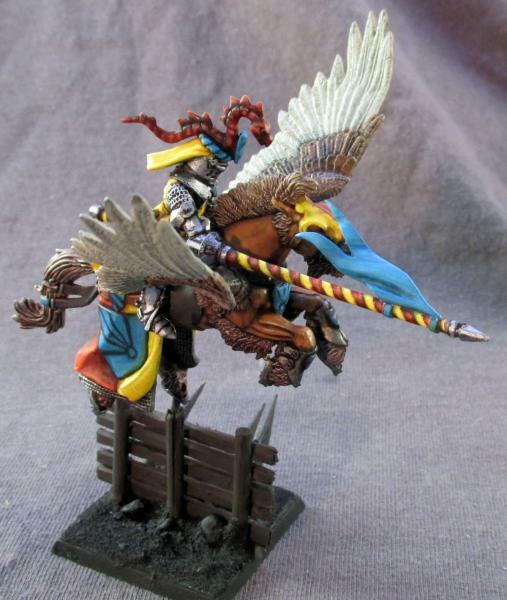 On the Heaven wizard, he just needs some shading and highlighting all around. I am pretty happy with the colors unless you have suggestions. The fire wizard though... I think that his pants and shirt need to be darker, like black and the outer robes need to be a darker red color. Right now he is just too bright! The flames will be bright, his clothes shouldn't be glowing. Thoughts? The Mortar. This is really close to done. Worked up the metal bits, but I just need to finish the little details on the crew and highlight the red a little more, then do something fancy to the base. I should have this wrapped up before the next Order update. Suggestions? The Knights Panther. Worked on knight 4. Did the hatch work of the blue and highlighted the armour a bit. Need to finish the cape, base, and some small details and we will have four of these guys done. Oh, and fish out a shield for him. Then only 5 more to go, should have them all done in no less than 5 or 6 years. Flagellants. 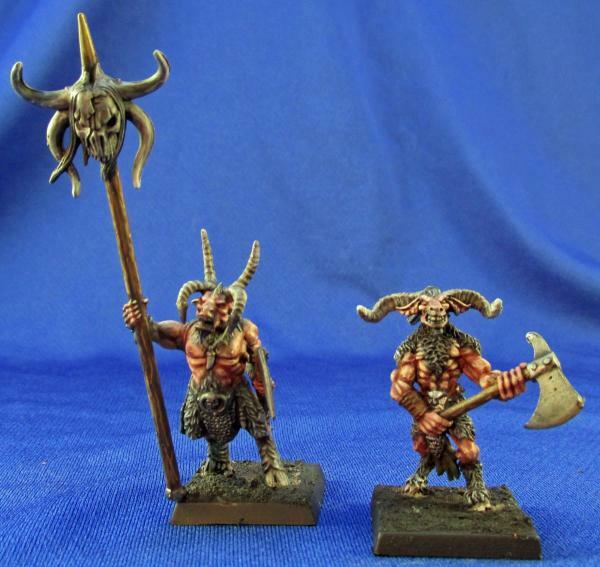 These are new old editions to the paint table. 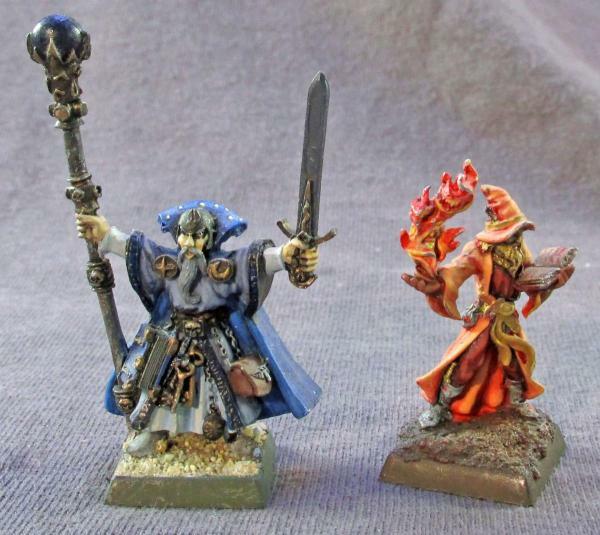 I had painted two as test models a long time ago (like 10 years or so), back when I still used gloss coat to protect them! Anyway, they are getting a redo. Worked up the robes, still needs a wash and some highlighting on them. 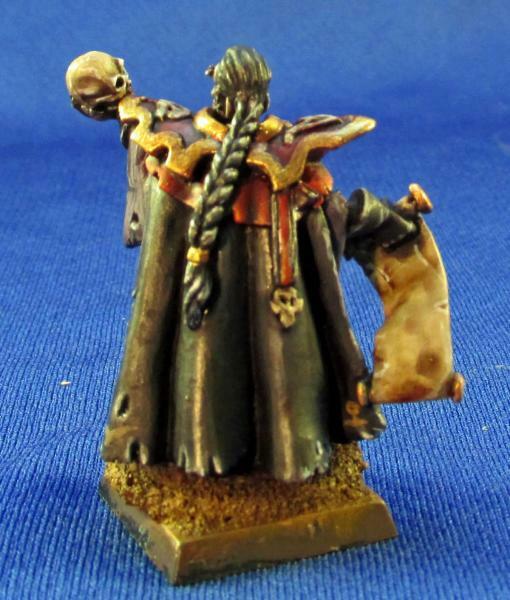 The plan with the robes is to paint them all with the same brown tones, but vary the wash color between browns and reds to give them a uniform yet varied look. All the rest is just base coat so far. Thoughts? And finally, the forces of the Lady. These knights... 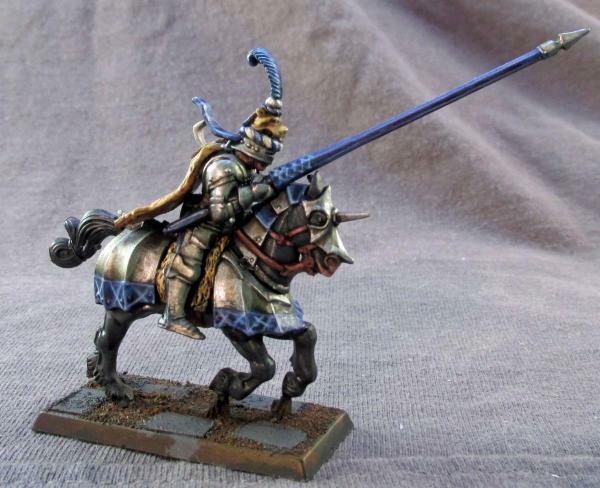 I feel like the knights themselves should come across as bright (which is not the way I normally paint), so that is what I am going for with the colors. I need to do something completely different with the shield emblems... maybe use horizontal stripes? Well, time to pull out the forces of Chaos for next weeks update, see you then. Spell Archer: Man, I can't stop laughing now! Prince of Spires: She is in her third trimester, so we will be having very little sleep in about two months! I have looked at some of the 9th Age stuff... I definitely commend them for going after it. I need to sign up for there site so I can dig a little deeper... but I may just stay in 8th for a bit. I don't play, just need a good story line and some sort of points system to help me build these armies. Next up, I am still not quite happy with my High Elf test model. I think you've done a good job with a so-so model. Yes, Red would give you more contrast but it might interrupt the 'Sea Elf' scheme that comes across here. 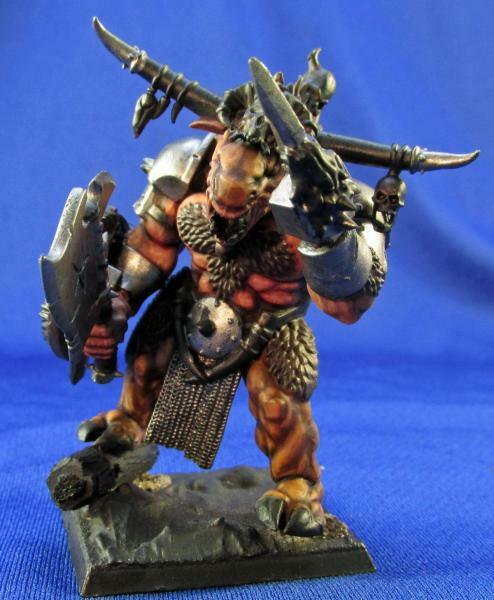 This is a Reaper Warlord model, anyone remember the name of it? No but nice model! Coming along very well. I am pretty happy with the colors unless you have suggestions. Love this guy! I can see you might want to 'tone' him a little but I like him just fine. I know this is a big change but is it worth considering a yellow or reddish metal here to complement the clothing and details? Great models! Look a challenge to paint though. I need to do something completely different with the shield emblems... maybe use horizontal stripes? Do a test shield? Heraldry's a tricky thing mind. I love Shaun the Sheep, it works on so many levels. My 13 year-old autistic son is a huge fan. And so, this week brings us to the forces of Chaos. Also, take a look at the pics, I changed the background to a blue from the grey I was using, trying to get clearer pictures. What do you guys think? So, I finally finished the third rank of Marauders. These took way too long, hopefully the final rank doesn't take nearly as long! Any comments on them? Once I find where I stashed the last five I will get them primed and ready to go. 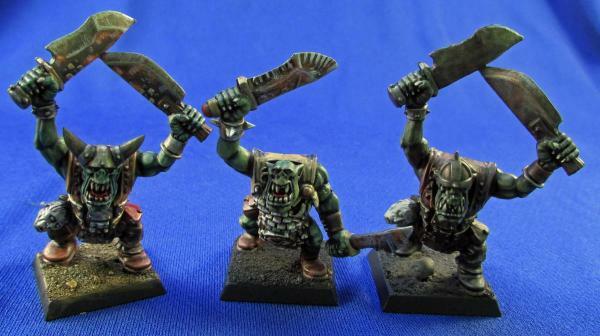 Ogres of Chaos! This guy is getting close to being done. I rusted him up a little, but the areas that still need to be done is: the second ogre head neck... completely missed it when I painted the skin. Leather bits need to be done. Bone bits need to be worked up. That should just about do it besides a final highlight on the metal bits, and some scarring on the mace. Demons! This guy is coming along nicely I think. I want to be able to do more to bring out his face though, any suggestions? It should still come off as red but something to help distinguish it? Beasts of Chaos! Worked up two more beasts, and they are not far from done. I need to separate the skull staff from the horns and hair a little... maybe a blood rune or something. I think the reaper beasts will fit right in with the unit as well! Thoughts? Started this guy from scratch this week, trying to work out exactly what type of skin color I want. I did the belly and soft spots in normal skin tones, and the back and rougher spots in browns, but I think I want a more reddish skin tone in the middle, and a darker skin tone on the back? The metal bits are just a base coat. 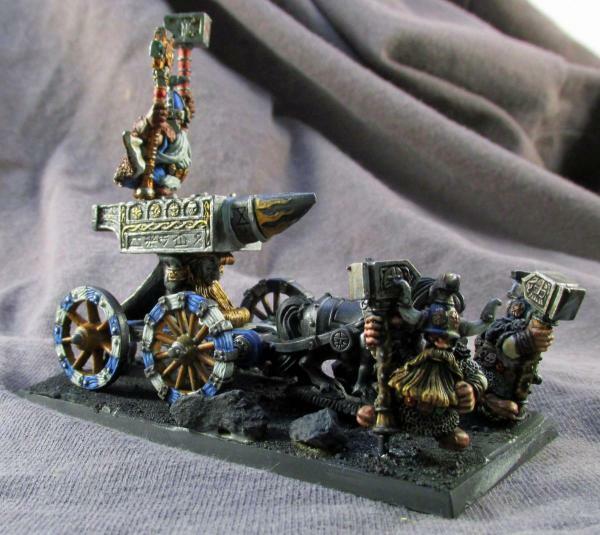 Chaos Dwarfs! I love where Mantic is going with there models, but the models themselves still have a lot to be desired compared to the detail that you get with newer models today. 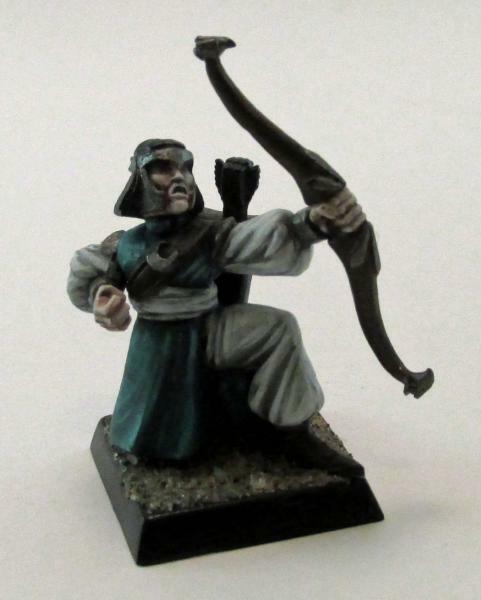 That being said, painting them reminds me of painting older Reaper and GW models, so its a bit nostalgic. The detail in the armour is just hard to make out. Right now I am just trying to flesh out a color scheme for this guy... 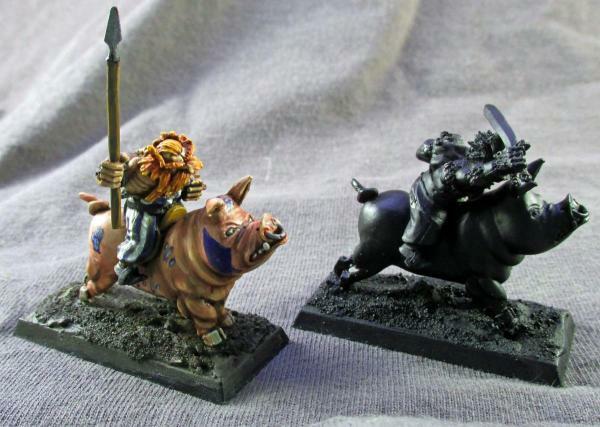 I am thinking golds, silvers, red outlines, and a darker color for the boar body? What do you guys think? Next week will bring us to the forces of Death! Spell Archer: For the archer, maybe purple then? Brass rings or brass body on the mortar? Yes, shields heraldry is a giant pain in the @**. These look fine to me, nicely done. They don't stand out perhaps but they're rank and file, they don't have to. Make it brighter I suggest. maybe a blood rune or something. Again, make the head brighter somehow? Love this guy! 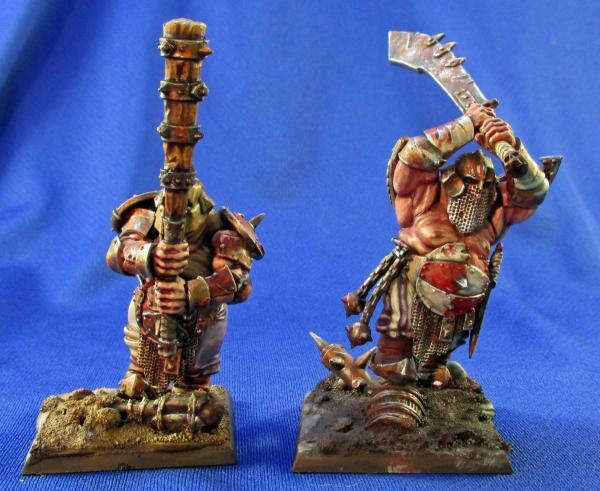 I feel reddish tones are especially good for Chaos Dwarfs. Purple worth a try I think. Yes, maybe brass body. This metal kind of looks right on antique ordnance. 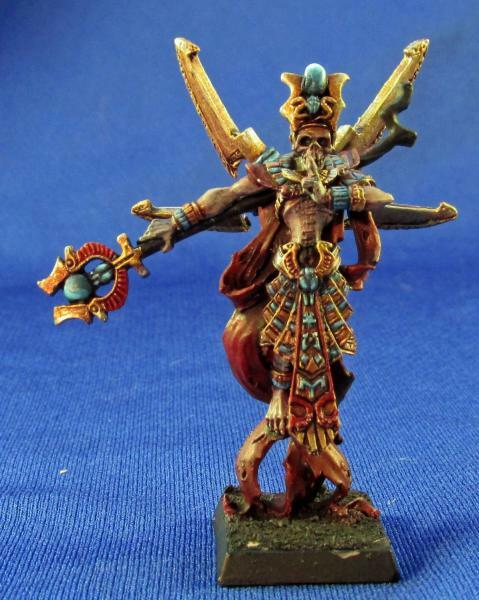 This week brings us to the armies of death, the Tomb Kings, Vampire Counts, and Dark Elves. I had considered the Dark Elves for the armies of Chaos, but I think that their sacrificial activities aligns them closer to death and bathing in the blood of the defeated. 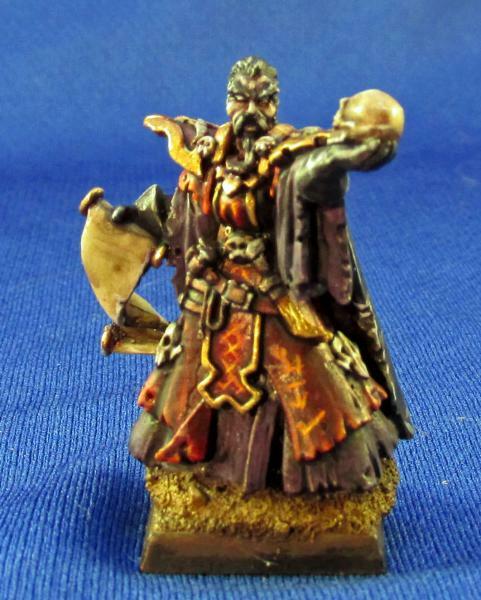 This is Reaper Miniatures Warlord Model 14236 Neb'nesew Nefsokar Warlord. 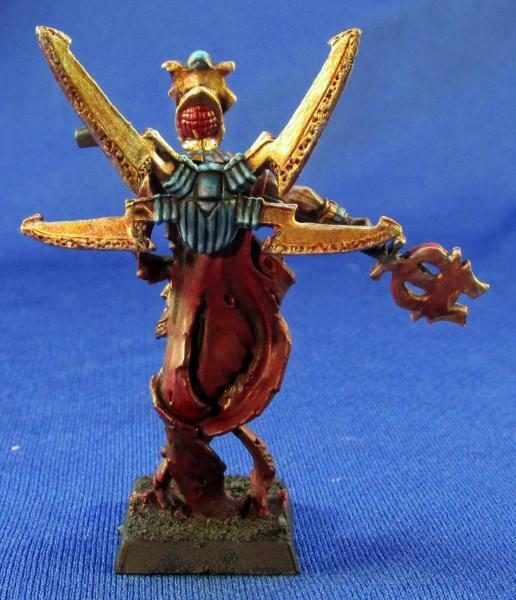 An absolutely beautiful model that will represent the start of the Tomb King army well. Sculpted by Tim Prow. He still has quite a ways to go until completion, but I like the colors so far. No significant questions right now, but any comments or suggestions are always useful! 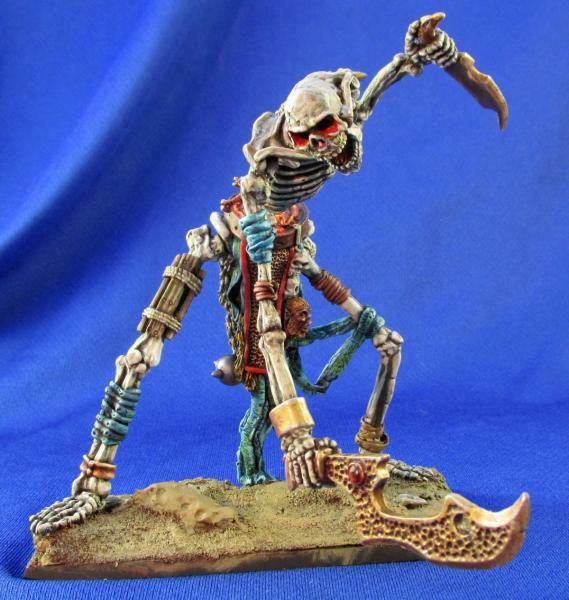 This miniature is from Reaper Miniatures Dark Heaven Legends model 02911: Colossal Skeleton sculpted by Jason Wiebe. I considered pushing through and just finishing him, but on my second thought I wanted to get some advice first. The glow effect to me is not completely convincing... from the eyes, mouth, and undercarriage of the ribs. How can I make this look better? Any tips would be helpful. For the desert base, I am going to highlight up to a nice sand color, but I am thinking red toned rocks? I also have to paint the ropes that are wrapped around the upper arm. 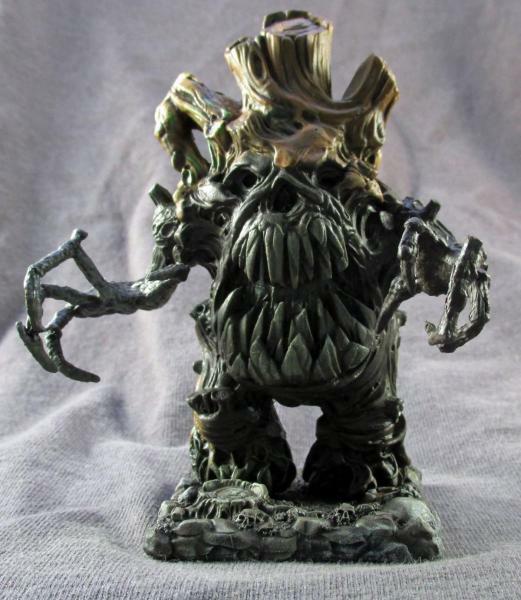 What else do you think can be done to help bring this mini to another level? 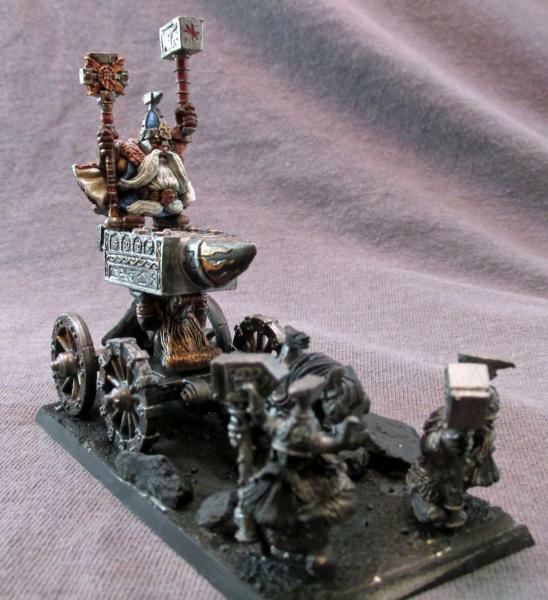 These are models from the 6th edition Games Workshop Tomb Kings. Not sure who sculpted them, if anyone knows please let me know. So far they just have a basecoat on the bones and the blue bits done up. Not sure on the shields... obviously I haven't weathered them yet, but I am thinking of making them red instead? This is Reaper Dark Heavens 02449 Callus Darklore, Necromancer. What do you think of the colors? Are they working together? Do the runes on the front of the robe pop enough? I need to add some script to the scroll. What else would you do to make him pop more? 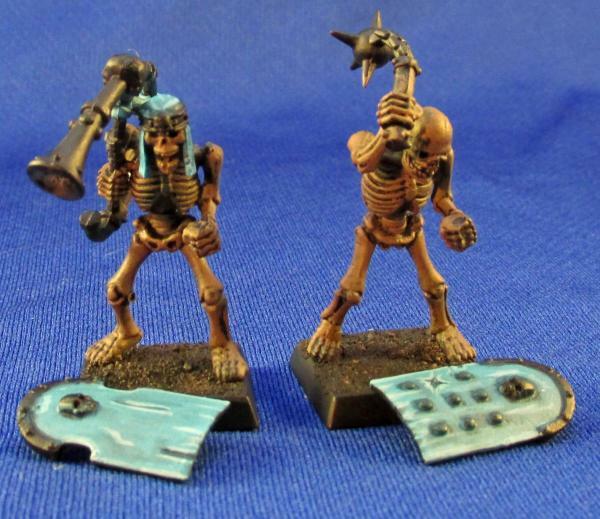 These are 8th edition (I think) or maybe 7th Games Workshop Skeleton Warriors. If anyone can confirm this, and who sculpted them? I threw the box away a while ago. The first three are pretty close to done, need to bring the red out a little more and another highlight on the bone, some more rust work. The last two just have some base coloring on the bones. 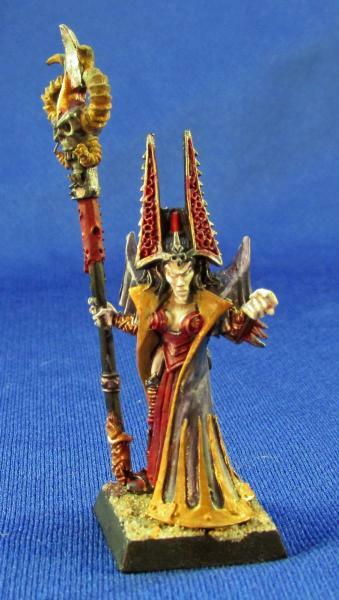 This is the Games Workshop Dark Elf Sorceress, fairly certain she is 5th edition, maybe 6th. Again, if anyone knows the sculptor or can verify the edition? Still working out the colors on her, I think I like the gold trim, and the purple, and the red... but I think I need to give up one of the colors to incorporate Green into the model. I plan to have some of that really nice looking green marble that I have seen done in other armies. I could always do the skull in green, but I would need to accentuate the green in other parts of the model to make it work. Maybe replace the red armor bits with green? Is that too many colors? Also, I need to work up some make up on her face, if anyone has good experiences with this? 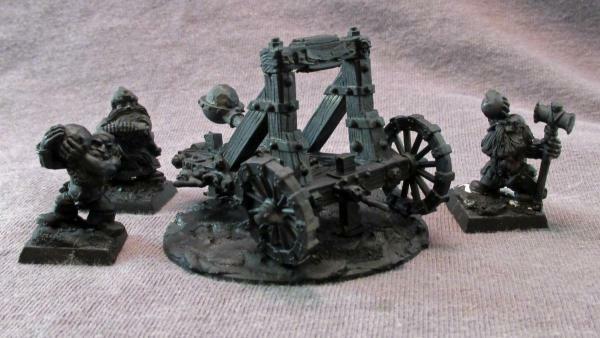 I also primed some DE Crossbows as well, but didn't think some them worth the picture without any paint on them at all. Next update I will start working them up. Till next week! 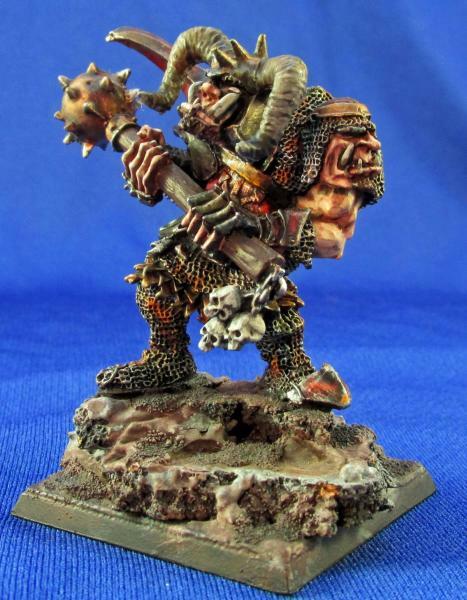 Destruction will reign with Orcs and Goblins, Ogres, and Skaven!!! Spell Archer: Thanks again for all the great comments, this kind of feedback really helps! I really like the Necromancer. I don't think the runes really pop but I'm not sure they need to. 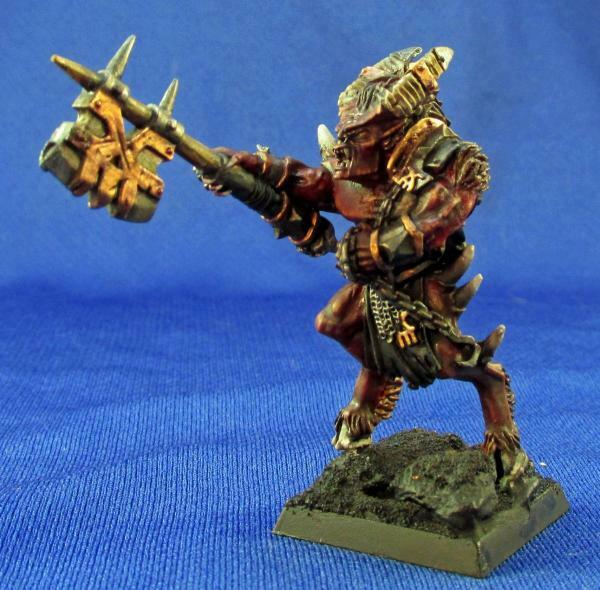 So, this week brings us to the Forces of Destruction: Orcs and Goblins, Ogres, and Skaven. I started this guy quite some time ago, and have never really been happy with how he is turning out. I didn't do a lot to him this week, but I went back through and started to re-evaluate the skin, adding some more tones and highlights to it. In addition, I blackened out some tattoos that I think will be appropriate. Probably need one more on his upper back as well. Please be very critical with him... areas I am particularly not happy with are the face, the scales on his arm, and a few other spots. 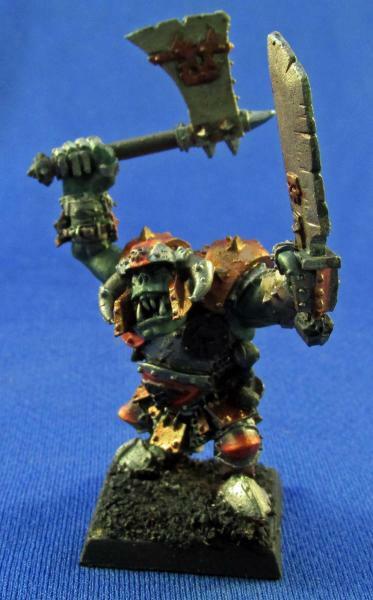 Now that I am introducing Orcs to the predominantly goblin army, they will need a suitable leader. Thus I bring you, Borgut Facebeater. Who better than Grimgors Ironhides second in command for this? Thus far, have really just base coated him, but you should be able to see the direction I am planning to go with him! Never too early for suggestions. 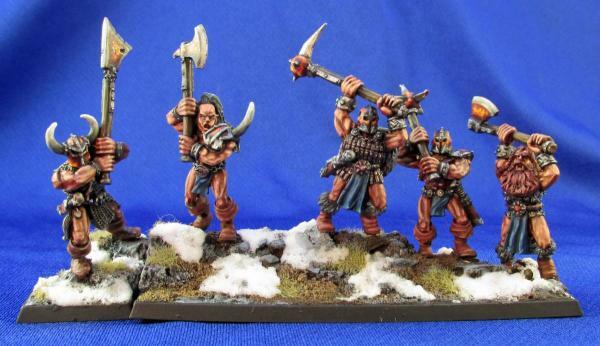 These guys are pretty run of the mill orcs, each carrying two separate hand weapons. I am going to have to lop of the hands and arms and replace a lot of the weapons to get rid of how uniform they are going to look if I don't (I have about 30 of them). But, with a little converting I think we should get some proper disorganization. Anyway, you can see by these three I am still trying to work out how I want them to look. The highlights all need to come up some, but the one with the checkers is the closest to finished and the one I am leaning towards using as a guide for the rest. Big question is do I change the colors of the tops/pants as you can see with these three? Are the checkers working? I added some to his back also, just feel like they are too clean for an Orc. Sculptor: Unknown. If anyone knows let me know, thanks. These were the ones that came in one of the WH kickstarter sets (maybe the one for 6th edition). This one is nearly complete, just a bit of highlighting and small details to go to call him done. Last minute critiques? Be very critical please. Also, I don't remember who manufactured or sculpted him, so any help with that would be great. I have to say, I am very happy with this one. Mostly because it is the first miniature, in a long time, that I have completely started and finished in less than a week. And he was a lot of fun to paint! 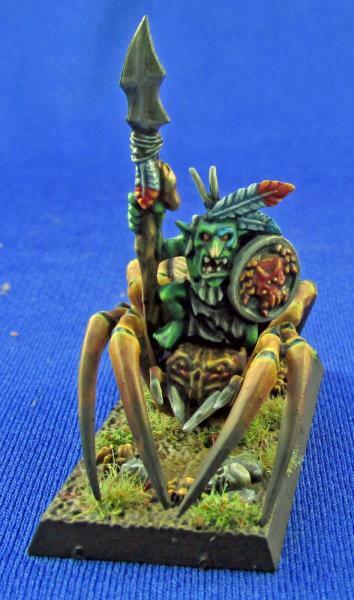 Anyway, we have 9 more to go (2o, but I plan to convert the other 10 into night goblin spider riders). If you have any critiques please let me know! Also, if there is interest in me doing a tutorial on painting him start to finish I would be happy to do that, just let me know if there is interest. I love this model, but there is just soooooo much going on with it. First, after the last three moves since I started painting him, the base that I created started to crumble. It was made with standard air dry clay... so, I went in with some elmers glue and to help keep it together. Hopefully this works. Anyway, painting wise, I am still not happy with my "blood and gore" effect. I feel like I am missing a critical color that would really set it off, just can't put my finger on it. Ok, I think I finally figured out how I want to do these guys. Please be very critical with comments since I am calling him done but still have the rest of the unit to paint! Ok, these are the first two of about 8 of these. Still working the weathering and basing, and lots of little details. Really want to get them finished so I can work on something with a bit more character... not that these don't have character, but they are the same sculpt over and over again. Bring on the critiques! So, this ends this week. Overall I think it was pretty productive. Next week we will be back to the Neutral armies! John: I will hit them again to make them pop more! You've been a busy man mousekiller! 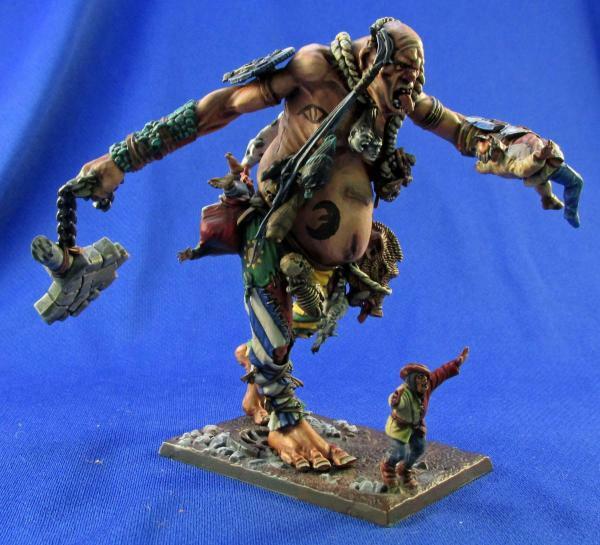 Sorry I can't help you with the Giant, just never liked the model. I feel the weapons need to glint, though I realise they probably need to look 'business' too. 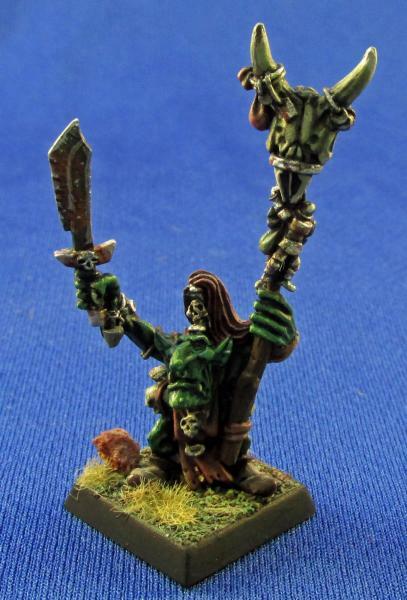 Pretty sure the Goblin Shaman is Brian Nelson, bang his style. Really like the effects on the spider! I feel like I am missing a critical color that would really set it off, just can't put my finger on it. Mustard Yellow worth a try? 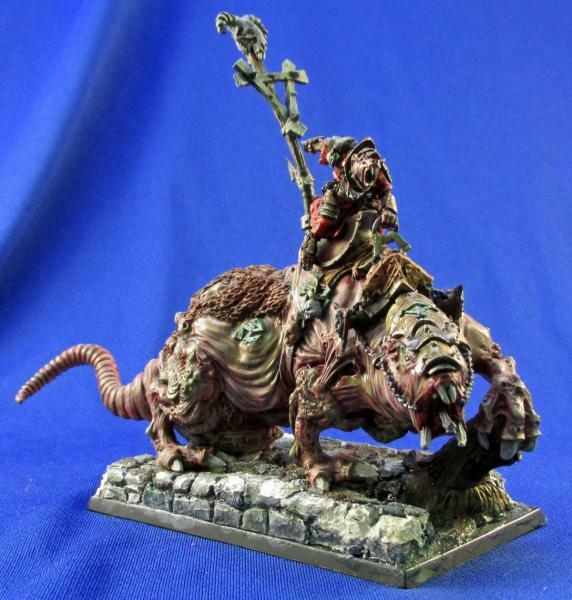 I love it for Pestilens and Nurgle.